MOTIONrehab are recognised experts in the field of stroke rehabilitation and has had great success in improving the quality of life of both adults and children following a stroke. MOTIONrehab are renowned for their person-centred approach to rehabilitation, personalising each individuals therapy to enable everybody to achieve their individual goals and reach their full potential. In April 2018, MOTIONrehab launched the UK’s first intensive outpatient neurological rehabilitation centre augmented by Robotics and Virtual Reality. The clinic based in Leeds offers specialist one-to-one hands-on therapy from experienced and highly skilled clinicians and uniquely MOTIONrehab clients spend time receiving high intensity specialist rehabilitation training with robotic and virtual reality devices. This allows patients to practice high repetitions of movements which is critical to neuroplasticity and recovery. The centre includes a range of upper and lower limb robotics. 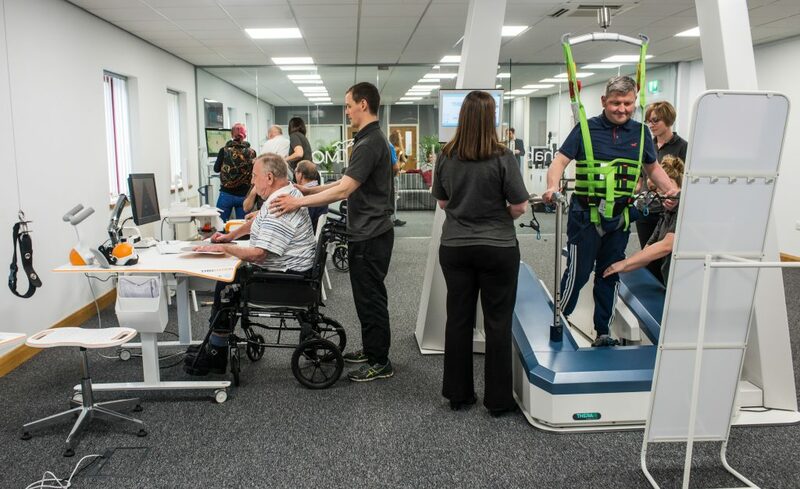 The MOTIONrehab centre is the only location within UK with all of these particular devices, giving the clinic International Reference Centre Status for treatment, teaching and research. The aim of rehabilitation is to help people do as much for themselves as possible, help them achieve their goals whether that be to get around the house, out and about in the community or back to work. MOTIONrehab recognises that everyones goals are personal to them and we take a person-centred approach to our rehabilitation programmes. A Stroke is the term used to describe the injury caused to the brain when it does not get enough blood supply. This can be caused by a blockage in the blood vessels or a bleed into the brain. Blockages may be due to a blood clot or a narrowing of the blood vessel which prevents the blood getting to the brain tissue on the opposite side. These are called Ischaemic Strokes. Bleeds are caused when the wall of the blood vessel becomes weak and bursts causing bleeding into the brain. These are called Haemorrhagic Strokes. Sometimes there is a temporary blockage in the blood supply to the brain which clears of its own accord, quickly and before any lasting damage to the brain is done. This is called a Transient Ischaemic Attack or TIA. The effects of a Stroke depend which part of the brain has been affected and what that part of the brain controls. Commonly, people have difficulties with movement. Stroke generally causes weakness down one side of the body. This is called a hemiparesis. It can also affect your sensation or how you feel things. People can have numbness in their arms and legs which can impact on their ability to move and do day to day activities. Other areas affected can be speech, vision or thinking skills (cognition). After a Stroke people with speech problems may struggle when they are trying to say the right words or have difficulties understanding and become a little muddled in conversations. A Stroke can also cause problems seeing the whole picture as areas of vision can be lost. When someone’s cognition is affected they may struggle with concentrating, planning and organising things.